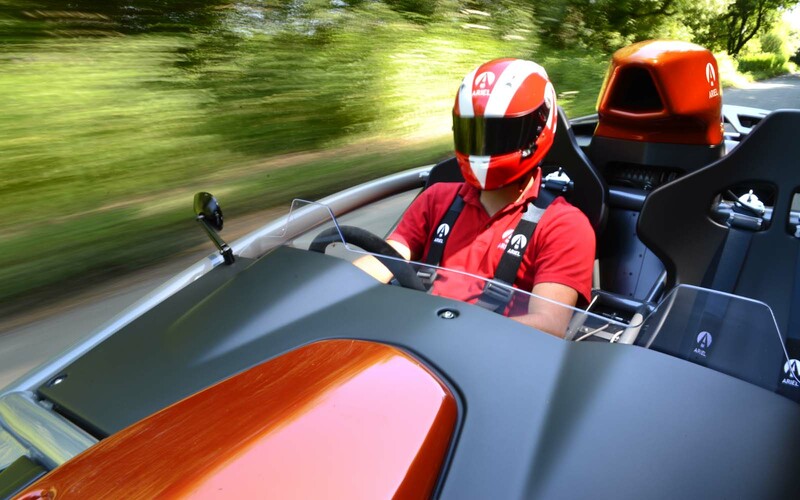 The new Ariel Atom 4, the fourth generation of the high-performance sports car launched in 1999, is the fastest standard version yet and has been entirely rebuilt from the ground up. 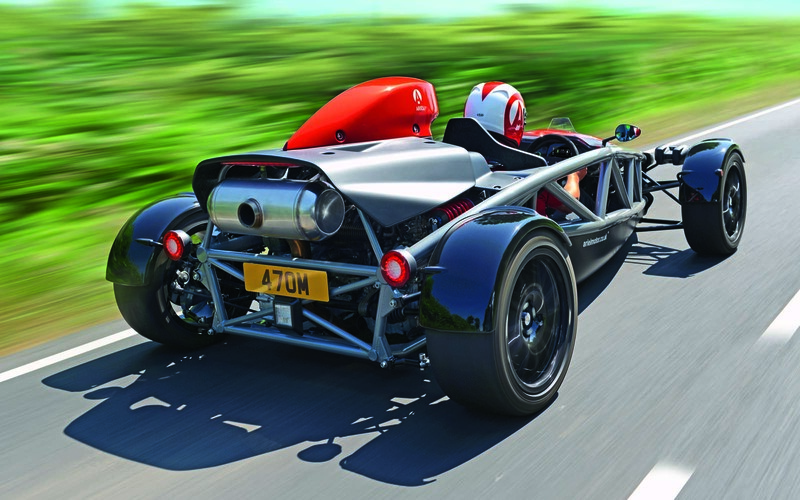 The Atom 4 can achieve 0-60mph in 2.8sec, matching its BAC Mono rival, and 0-100mph in 6.8sec. Priced from £39,975, it has made its public debut at this week’s Goodwood Festival of Speed. Deliveries are due to commence in spring 2019. It uses the latest Honda Type R's 320bhp turbocharged engine and features a new chassis, suspension, steering, brakes and bodywork with “significant aerodynamic improvements”, says Ariel, as well as new seating and instrumentation. 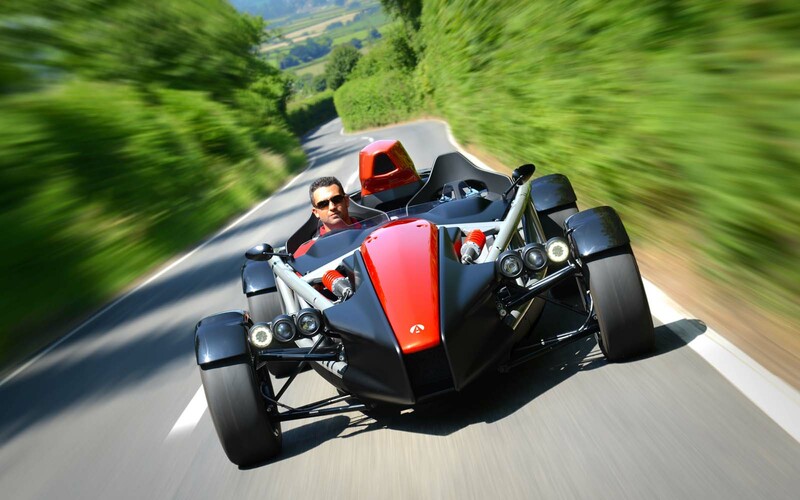 Ariel boss Simon Saunders said: “The Atom 4 is the biggest change to the car since we originally released it in 1999. Ariel plans to make 100 cars annually alongside its Nomad and Ace motorbike at its factory in Somerset. It will also be built under licence in the US, a vital market for the maker. Plus, it will be the first Ariel vehicle to undergo a specific type approval that allows it to be sold throughout Europe and Australasia. The basis of the Atom 4 is a new tubular chassis, built in-house, which features larger-diameter main and diagonal tubes than previous Atoms. Torsional stiffness has been increased by 15% compared with the previous-generation Atom 3.5, launched in 2013. The chassis also promises more interior space and leg room, and it has been proven to exceed the demands of a full-frontal 50km/h (31mph) barrier impact, seatbelt and rear impact test, said Ariel. The engine has been mapped by Ariel using an ECU developed specifically for the car and optional launch and traction control are now included, derived from the Atom V8. 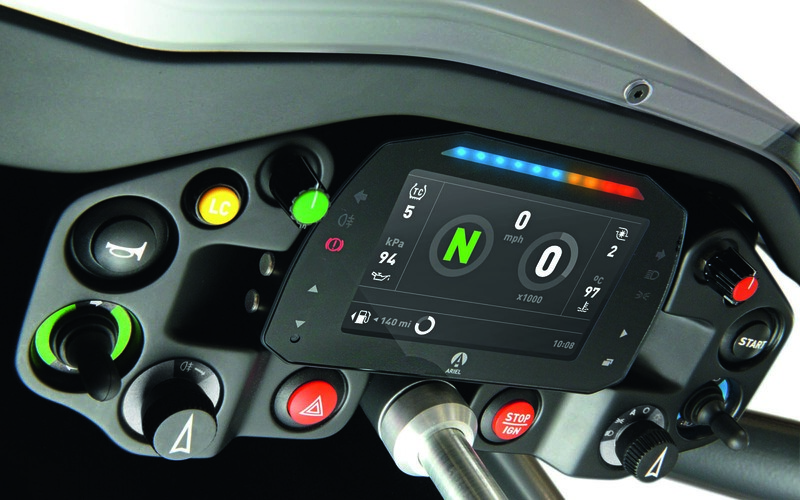 The Atom 4 is also able to adjust and optimise turbo boost levels for different road and track conditions. There is a larger fuel tank than before, giving a road range of 300 miles. The Atom 4 retains the inboard, pushrod-operated damper system but features all-new suspension geometry, which includes revised inboard and outboard points plus anti-squat and anti-dive intended to reduce unnecessary body roll and weight transfer. 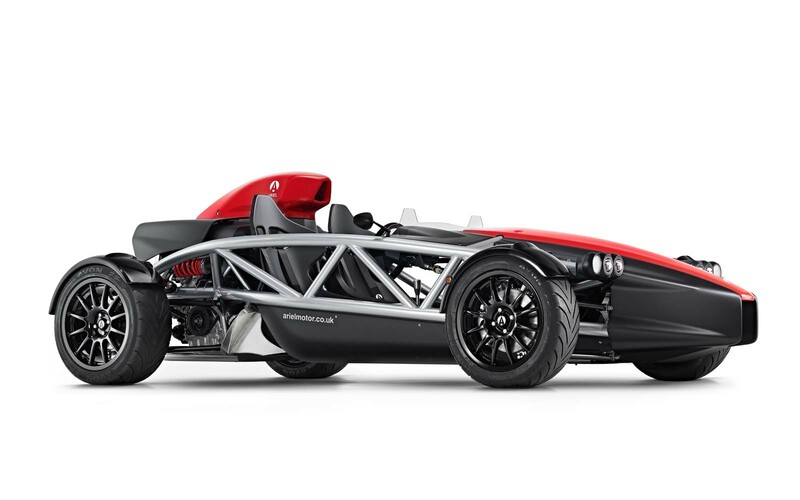 This and the revised steering rack make the Atom accessible for all types of drivers, says Ariel, and there’s the option of a quick rack for track-focused cars. The model sits on 16in front and 17in rear wheels. Multi-spoke alloy wheels are standard but there is also the option of full carbon wheels for the first time. These are nearly 50% lighter than alloy wheels. The Atom 4 uses high- performance Avon ZZR tyres. Ariel said: “The combination of new suspension and larger- section Avon tyres contributes to the Atom 4 having more mechanical grip than any previous Atom.” It added that cornering speed moves to “another level”. There's also a new, larger braking set-up to accommodate the Atom’s extra power. 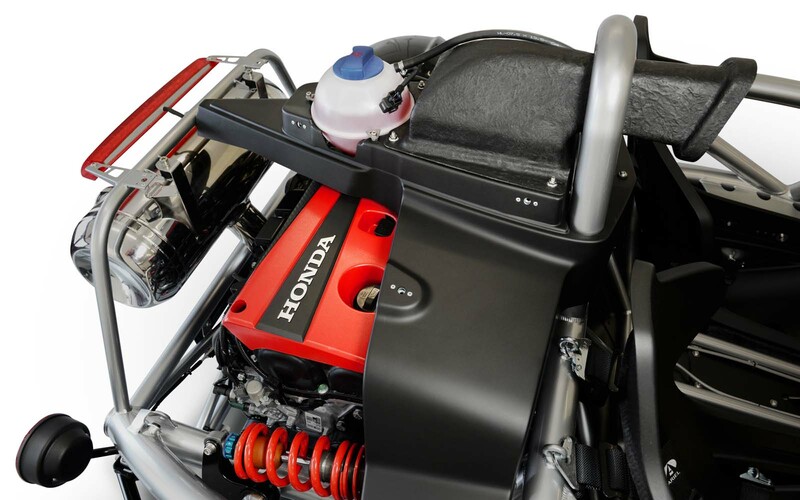 Ariel has done significant work to the body, with all-new panels improving aerodynamics. The most obvious change is the disappearance of the central Atom roll hoop, now enclosed under the air intake bodywork.The Atom’s ‘aero screen’ now reaches all the way across the car, reducing ‘helmet lift’ and directing air to the engine intake, and with just this aero fence, claims Ariel, generates nominal downforce. Comment by Matt Prior: "I can’t wait to drive it"
Ariel has often wondered how big it ought to grow as a car and bike company. When you’re small and doing interesting things that nobody else is doing, life is great. When you’re large and competing with the big players, life can also be great. Being stuck somewhere in between, with a model that has obvious direct competitors but without the full benefit of an economy of scale to compete fully, is a position Ariel hasn’t wanted to be in. The Atom 4, then, is the car that still does sufficiently unique things. I’m intrigued by two aspects particularly. One is the new suspension geometry, with its anti-dive qualities. The Nomad showed me things I didn’t think possible for a road car to do regarding body control, so a bit of that magic could be sensational.The other is the turbo Honda engine, replacing the old normally aspirated or supercharged version. At 300bhp-plus, it’s a serious proposition at its entry point. Where does it go from there? As long as it's stable at speed, who cares? What matters is that it will be huge fun to drive. They could add plastic panels enclose the car to a greater degree to the wind massively reducing drag without adding substantive weight which could significantly raise top speed with merly slight weight increase. Doubt that the vehicle would feel any less fun. Why do manufacturers of cars like this continue to boast about the 0 to 60mph time? Of course, like any very powerful rwd car it around 2.8 seconds, since this corresponds with 1g acceleration which can't be bettered without slick tyres and downforce. It's just another way of saying that acceleration is traction limited at low speeds. I doubt whether even an F1 car could do much better. Frankly, I'm more impressed by the fact that the latest Atom has type approval. Now that must have been really challenging!